Milos is in the Western part of the Cyclades and covers approximately 151km2 (58.3mi2) and in 2001 had 4.771 inhabitants. Only 1/5 is populated. Its capital is Plaka but the towns of Pollonia and Adamas are both larger. Milos is well known through the famous statue of "Venus de Milo" (currently at the Louvre) and statues of the Greek god Asclepius (now in the British museum). In antiquity the island was prosperous due to its great mineral wealth. Also because of its, now extinct, volcanic activity it has unique beaches like Sarakiniko and Papafragas. Near the settelment of Trypiti one can see the only Christian catacombs in Greece. 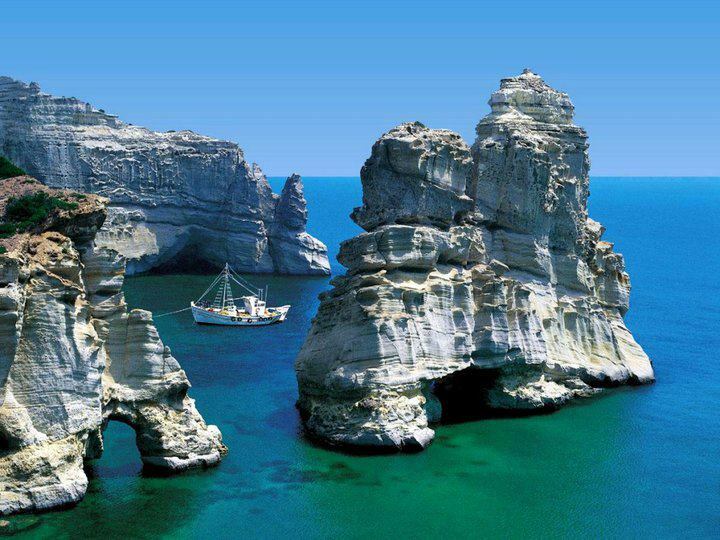 Interesting information about Milos can be found through the Greek Travel Pages (GTP) and Wikipedia. Adamas, which is located inside the great bay which constitutes one of the biggest natural ports of the Mediterranean. Ferry connections and schedules for domestic routes, like Milos, are usually announced by most shipping companies, a couple of weeks before the beginning of each season. Information concerning Athens ports serving routes to Milos can be found further down. Cyclades islands - Anafi, Folegandros, Ios, Kea, Kimolos, Koufonissi, Kythnos, Mykonos, Naxos, Paros, Santorini, Serifos, Sifnos, Sikinos, Syros. Dodekanese - Chalki, Karpathos, Kassos, Rhodes.